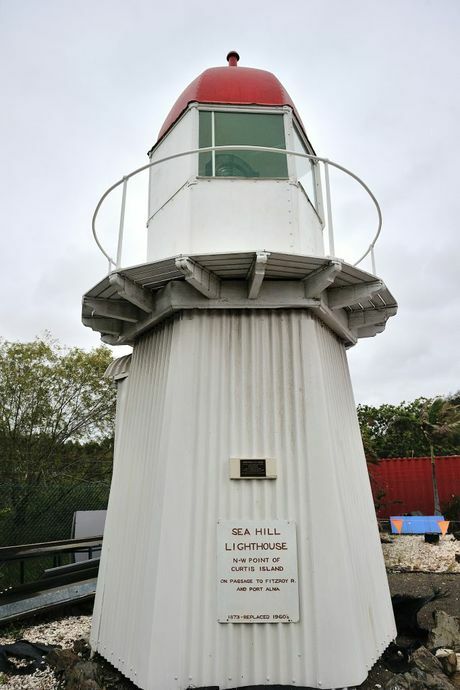 THE historic Sea Hill Lighthouse originally erected on Curtis Island will be installed at the new East Shores precinct near the mouth of Auckland Creek. The lighthouse will join other artefacts from Gladstone's Maritime Museum, including navigational buoys, anchors, and bollards from the old Auckland Point Wharf. The lighthouse was originally erected at Sea Hill Point at the north-west end of Curtis Island in the late 1800s to aid coastal navigation by marking the east side of the entrance to Keppel Bay, on a passage to Fitzroy River and Port Alma. The first in Queensland of its design, Sea Hill Lighthouse was made of a hardwood frame clad with corrugated iron. Unlike the Queensland lighthouse towers that followed, its base is hexagonal in shape, rather than round. When a second lighthouse was built in 1895, the original lighthouse remained on site adjacent to the new, taller lighthouse. It was moved to Grassy Hill to replace the flashing light there in the late 1940s, and was later relocated to the Gladstone Maritime Museum. The lighthouse has now been moved to the East Shores project site and will be positioned toward the mouth of Auckland Creek. The precinct, which is due to open later this year, is being delivered by Gladstone Ports Corporation and Wiggins Island Coal Export Terminal.